Topics: Canada's Outdoor Farm Show, Madison World Dairy Expo, and Royal Agricultural Winter Fair. Its 2 nameservers are ns22.montanahosting.ca, and ns17.montanahosting.ca. It is hosted by Allstream Corp (Ontario, Toronto,) using Apache/2 web server. 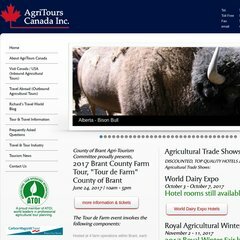 Agritourscanada.com's server IP number is 209.112.59.38. PING (209.112.59.38) 56(84) bytes of data.